Move over medium sharp cheddar, American singles, and Cheese Whiz. Manchego, Livarot, Abondance, Morbier, and Magtag Blue are muscling their way onto grocery store shelves.Cheese will prove to be in this decade what wine was to the 1990s. Remember when wine was classified as red and white? Now you can find more wine tastings than you would want to. Now we will take the cheese. In the cheese world, only recently have Americans found a selection beyond Blue, Brie, Chevre, Feta, Havarti, Jarlsberg, Parmigiano-Reggiano, Roquefort, and Stilton. Today, some restaurants offer selections of interesting little-known cheeses. In fact, one New York City restaurant, Artisanal, features dozens of cheeses, domestic and imported, and has a maitre fromager, the head cheese. Ordering Brie is becoming almost as passe as ordering Chablis. But a problem looms large in the cheese industry. Federal, and international, food regulations may change the taste of cheese. While no one would elect to return to Sinclair Lewis' unregulated slaughterhouse era, nor to China's slack approach to how (and which) food is prepared, some food regulations, particularly those pertaining to cheese, specifically raw milk cheese, just do not make sense. The best-flavored cheese is made from unpasteurized, raw milk. Heating milk to the temperature of pasteurization changes the flavor of the milk and its subsequent products. Heating milk past 100°F has the effects of neutralizing many of its inherent characteristics. By 160°F, the milk no longer tastes vibrant, but cooked. Since 1985, US law has forbidden the import of raw cheeses that've been aged less than 60 days, and the law favors cheeses that are made from pasteurized milk. Epoisses, fermier French Chevre, true Brie and its sister cheese Camembert, as well as hundreds of other imported farmstead raw milk cheeses, may not be sold in the US market. Real brie, such as Brie de Coulommiers, thought to be the progenitor of all Bries, is made from raw cows' milk. Consequently, what many Americans believe to be true Brie is not. We're merely eating an imported named-alike pasteurized cheese. The argument against fresh from the cow, sheep, or goat milk, whether in cheese or not, is that fresh milk is, quite simply, teeming with bacteria. Consumers of raw milk may contract listeriosis, salmonellosis, or E Coli with potentially serious results. However, the other side of the argument is if fresh milk is properly, hygienically handled, the milk is safe and the flavor is better. Those who argue in favor of raw milk cite the lawful consumption of other raw dishes: raw steak and raw tuna tartare, sushi, sashimi, carpaccio, Lebanese kibbeh and the raw egg in Caesar salad dressing. They note that as a cheese made from raw milk ages, the possibility of contamination decreases. During the cheese's aging process, the cheese builds up acids, which cause it to "self-pasteurize," making it safe to eat. Hence the two-month aging requirement on imported cheese. But currently there's an international push for all cheeses to be made from pasteurized milk in hyper-hygienic facilities. To counter government regulations, some groups of cheesemakers, such as the Specialist Cheesemakers Association of Great Britain, have initiated their own "code of practice" detailing hygiene procedures during raw milk cheese production. But still, many of the cheeses they produce may not be imported into the US. Nowhere is the impact of these fluctuating regulations being felt more than in America's developing artesian cheese market. Some of the best American cheese is limited production, farmstead cheese. Most of these cheeses are made with raw milk. Farmstead is a term used to denote cheeses made exclusively from milk from a farm's own herd, similar to a single vineyard wine which is wine made from specific vineyard's grapes. Typically, small batches of farmstead cheese are made by hand, and have a unique texture, flavor, and color and, like their wine counterparts, are of higher quality and thus more expensive. In New England, a plethora of farmstead cheeses are being made. 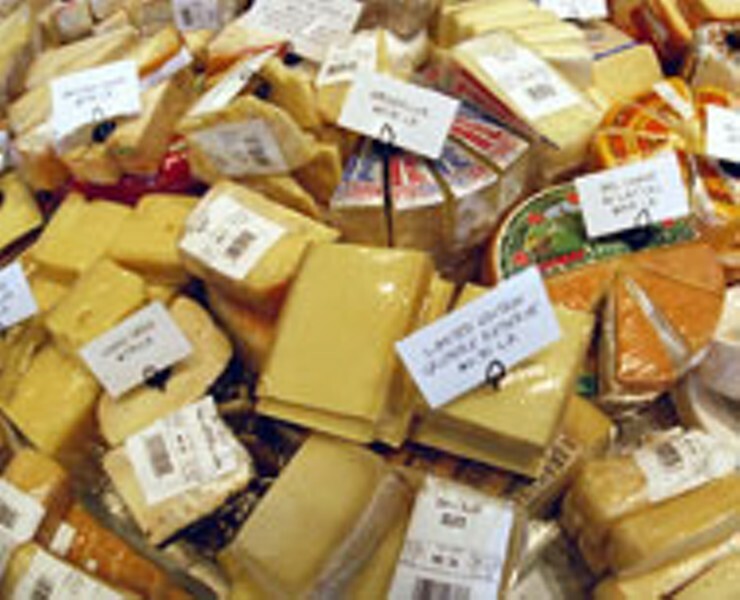 Farmhouse cheddars are produced at Shelburne Farms and Grafton Village Cheese Company; Green Mountain Blue Cheese makes farmstead blue; Cato Corner Farm produces farmhouse Caerphilly, Colby, Dutch-style, Montasio-style, Trappist-style, and Blue cheeses; and Neighborly Farms makes a farmstead feta. Literally dozens of farmstead cheese dairies have sprung up in New England during the past decade. One of the best of this new breed of farmstead cheese is Fanny Mason Farmstead Baby Swiss made by Boggy Meadow Farm in Walpole, New Hampshire, by a former Wall Street investment banker. This handcrafted raw milk cheese has a rich, creamy mouth feel, a savory nutty flavor, and melts smoothly. This is an outstanding cheese. Another raw milk cheese is Shelburne Farms' cheddar from Shelburne, Vermont. This cheese is everything American cheese should be: smooth and mellow when young, biting as it ages. An excellent New England artisan cheese is Vermont Brie made by Blythedale Farm in Corinth, Vermont. This cheese isn't raw because in order to disperse the high fat content of the cow's milk evenly, the milk is pasteurized, very slowly and over low heat. Other New England farmstead producers are so small their products reach only the neighboring grocery stores and farm stands. Such is the case of Nunsuch goat cheese, available daily from Nunsuch Dairy, in Bradford, New Hampshire. The name of the dairy refers to the fact the owner and cheesemaker is a former Roman Catholic nun. Her cheeses are, however, pasteurized. First came the artisanal bread revival, then the astonishing interest in wine. Finally Americans are diving into the character and flavor of artisanal cheese. What bread, wine, and cheese have in common is they each depend on yeasts and bacteria for their development. Ultimately, however, the future of American cheese and cheese consumption in America will not lie in this new popularity, but in the laws governing its production. Have a restaurant tip, compliment, complaint? Do you know of a restaurant that has opened, closed, or should be reviewed? Does your restaurant or shop have news, menu changes, new additions to staff or building, upcoming cuisine or wine events? Fax information to Eaters' Digest: 704-944-3605, or leave voice mail: 704-522-8334, ext. 136. Note: We need events at least 12 days in advance. To contact Tricia via email: TLChild@bellsouth.net.